Beautifully engraved certificate from the Financial News Network issued in 1987. This historic document was printed by the Jeffries Banknote Company and has an ornate border around it with a vignette of the company logo. This item has the printed signatures of the Company’s Senior Vice President ( C. Steven Bolen ) and Chairman ( Earl W. Brian ) and is over 30 years old. This is only the second time we have seen this company's stock certificate for sale. The Financial News Network was a finance and business news television network that operated throughout the United States during the 1980s. The channel was bought by and merged with CNBC in 1991. 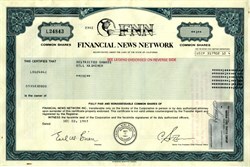 Financial News Network (FNN) was founded in 1981 by two men: Rodney Buchser, who had been general manager of KWHY in Los Angeles, and Dr. Glen H. Taylor. The concept originated in New York City via a Newark, New Jersey UHF independent TV station in 1975 on Blonder-Tongue Broadcasting WBTB-TV CH 68 (now WFUT) when Eugene Inger, a registered investment adviser, started his daily Wall Street programming in the fall of 1975 (known as Wall Street Perspective at that time). Keith Houser, the station's general manager, negotiated with the New York SEC office to get the ticker tape to crawl across the bottom of the screen with a two-hour delay, due to the SEC worrying that it might "destablize" the market. The ticker ran across the lower third of the screen, with stock prices on the top (white) band and index prices on the bottom (blue) band. After the first year of programming the SEC permitted just a twenty-minute delay. KWHY was the first West Coast TV station to offer daily market news accompanied by a digital stock ticker "crawl" at the bottom of the screen. Los Angeles traders and investors could stay on top of market action without subscribing to an expensive stock quotation service. Computers at that time could not keep up with the full stock feed and as such, the ticker could only show preselected stocks, making the system highly manual and clumsy. The first fully automated stock ticker to appear on television was in 1996 on the CNNfn network. FNN received its early private financing from Biotech Capital Corporation, which later changed its name to Infotechnology, Inc. Biotech Capital was also one of the few publicly held "Business Development Companies" - governed by the Business Company Development Act of 1980. In 1981, shortly before its Initial Public Offering, led by the Paulson Investment Company, Mr. Taylor, then the Chairman, resigned due to previous legal difficulties. Mr. Jeremy Wiesen, a professor of business accounting and entrepreneurship at the Stern School of Business, New York University, and formerly with the Securities and Exchange Commission, became Chairman. The network's principal audience were small investors. FNN's principal studio was in Santa Monica, California, but it then established operations in New York, on the ground floor of Merrill Lynch's headquarters in Manhattan, where passersby could view its broadcast operations. Merrill Lynch was one of the initial private investors in FNN. In 1985, FNN severed ties with its broadcast stations and established a 24-hour feed on cable TV only. At night, it added SCORE, a mini-network that aired sports events and news. Also airing in the overnight hours was Venture, a series of long-form speeches by business leaders, and TelShop, a shop-at-home service. In the late 1980s, Infotechnology Inc., the New York-based information technology and venture capital company (chaired by Earl Brian) which also owned United Press International, increased its position to 47 percent, and remained one of FNN's largest shareholders until Earl Brian, the CEO of UPI and FNN, was later convicted on fraud charges specific to UPI and FNN. At its height, FNN was available on 3,500 cable systems, reaching a potential audience of 35 million homes across the country. FNN moved into newly built modern TV studios and production facilities in the Wang building in Los Angeles and in New York's Rockefeller Center. In February 1991, FNN reached a handshake agreement with a partnership of Dow Jones & Company and Westinghouse Broadcasting (Group W) for $90 million. However, just a few days later, FNN agreed to an unexpected $105 million offer from NBC, owner of FNN's then two-year-old rival, CNBC. NBC had encountered problems getting cable systems to carry CNBC, and intended to merge CNBC with FNN (at the time, CNBC was only in 17 million homes). However, matters were complicated in March when FNN filed for Chapter 11 bankruptcy, triggering a lively bidding war for the network. Group W and Dow Jones raised their offer to $115 million, only to be turned down on a technicality by Bankruptcy Court Judge Francis Conrad; Dow Jones and Group W refused to keep the bidding open until May 31, 1991. NBC then raised its offer to $115 million, which was accepted by Conrad. That decision, however, was overturned on appeal. FNN went off the air for the last time at 6 pm on May 21, 1991. CNBC immediately took over FNN's satellite transponder space, more than doubling its audience at one stroke. It branded its business day programming as "CNBC/FNN Daytime" until 1992. CNBC incorporated features of FNN's ticker into its ticker. While most of FNN's employees were fired, a few FNN anchors and reporters including Bill Griffeth, Ron Insana, Allan Chernoff and Joe Kernen were retained. Sue Herera, who joined FNN at age 21 and very soon became an anchor, moved to NBC and the brand-new CNBC prior to the demise of FNN. Griffeth and Herera were later reunited at CNBC and co-anchored Power Lunch until 2011. CNBC adopted the "look", news style and stock ticker of FNN, so in a sense FNN's legacy continues in CNBC. LOS ANGELES (AP) --Two former top officials of United Press International and Financial News Network were indicted Tuesday on charges of conspiring to conceal the companies' poor financial condition in the late 1980s. Former UPI and FNN Chairman Earl W. Brian and his chief operating officer, John F. Berentson, were accused in the 24-count indictment of lying to obtain $56 million in bank loans in 1989. Brian headed Infotechnology Inc., a New York company with controlling interests in UPI, the international wire service, and FNN, a business and financial news cable TV network. Brian and Berentson are accused of falsifying FNN's books to deceive banks, regulators and investors, using millions of dollars from fraudulent lease transactions to keep the companies running, and lying to their outside accountants to conceal the scams. Brian's attorney, Richard Marmaro, said he hadn't seen the indictment and declined comment. Berentson's attorney, Mark Beck, said Berentson will dispute the charges. In 1993, Brian settled Securities and Exchange Commission charges of inflating FNN's revenues by millions of dollars, with no admission of guilt. Three executives named in the SEC suit, C. Steven Bolen, Gary A. Prince and Mitchell H. Young, were named as co-conspirators in the indictment. Prosecutors said Bolen and Prince were cooperating with the government. Bolen has pleaded guilty to charges of conspiracy, securities fraud and bank fraud and Prince to charges of conspiracy and making false statements to the SEC. Young was to be arraigned Monday. Los Angeles-based FNN, which sustained losses totaling $72.4 million in 1990, filed for bankruptcy protection in 1991 and later sold its core media operations to CNBC, a division of the National Broadcasting Corp.
UPI, once the second-largest U.S.-based news service after The Associated Press, was founded as United Press by E.W. Scripps in 1907 and merged with William Randolph Hearst's International News Service in 1958. It was sold in 1982 and filed for bankruptcy protection in 1991. It was sold in 1992 to Middle East Broadcasting Centre. Brian, 53, was secretary of California's Health and Welfare Agency when Ronald Reagan was governor. He sought the GOP nomination against Democratic Sen. Alan Cranston in 1984, but lost in the primary.